I have been selling hand printed cards from my Etsy online shop. If you would like to by one then you can find it HERE. I am posting orders out as they are received but cannot now expect them to arrive outside of Europe before Christmas. I am planning a range of hand printed cards that will be available throughout the year. I also accept commissions for your own personally designed, engraved and printed card and am now taking orders for Christmas 2013. It has been another busy and successful year in the studio. I am currently working on my 80th bookplate and plan to display some recent ones in the New Year. I am also working on a couple of ideas for new handmade books from The Isle Handpress; one will be a nature subject and the other an episode from my childhood that influenced my eventually becoming a printmaker. I will, of course, be continuing to blog about my work here and also show work in progress on my Facebook artist page, which you can follow without having to become my "friend". I wish you all well as the Christmas season approaches and thank you for your continued interest and support. 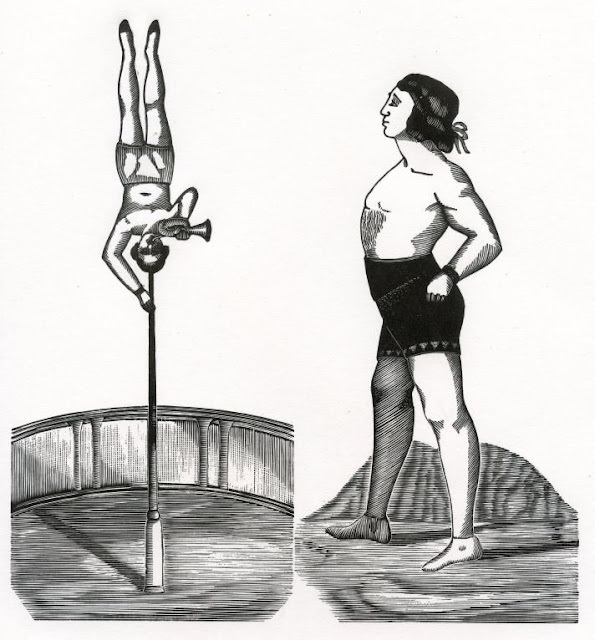 Earlier this year I was contacted about a very singular project - to recreate the engravings from a Victorian circus poster. This in itself wasn't all that interesting. I am an engraver for hire and am offered a wide variety of work. What made this fascinating was the fact that this was the poster that inspired John Lennon to write the song "For The Benefit of Mister Kite" that was on the Beatles' "Sergeant Pepper" album. These images would have been printed from "stock" blocks in the printer's workshop. They probably didn't even belong together and may have been trimmed to match. One way or another there was a lot of "noise" in the images that we had. The blocks would have been old, possible mistreated, inked and printed hastily and then we were looking at copies of copies of the original. After much discussion and many drawings, I started to mark out the designs on to two lemonwood engrain woodblocks, pick up my tools and start to engrave the images. Lennon's Poster from Make Productions on Vimeo. Finally, the whole story is told and the finished poster can be seen HERE. I do enjoy portraying wildlife into an appropriate setting and staying at Swift Cottage in Derbyshire gave me a chance to engrave a rather different landscape from my native Fenlands. The swifts were certainly there. They are a favourite bird of mine. 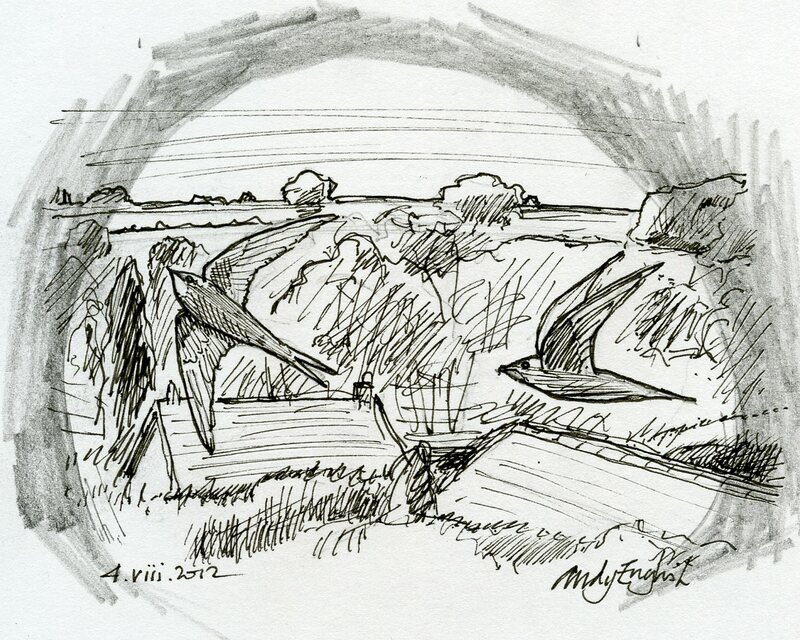 Originally, I was going to show two swifts in the foreground as this rough sketch shows. I was very pleased with State IV and decided that nothing else needed to be done. Here is the finished engraving which will be published in an edition of 125, printed from the original block. It is available HERE. During the month of October 2012, it will be offered for a special price. I have enjoyed my collaborations with The Jericho Press and so I was very pleased when another was proposed. I was intrigued when this commission proved to be not only a map but also a coloured map. I do not make multi-block coloured engravings but I do enjoy a challenge and so I decided to have a go. The map features parts of Lake Urmia whic is in itself a very interesting lake. I drew out the agreed map outline in reverse onto a boxwood block and started to engrave around the lines and text to make the black key block. I printed a proof from the block and hand coloured it in watercolour. I then used this to make three separate colour blocks. I used "Resingrave", an artificial engraving medium to make these. All of the blocks required a great deal of clearing which is time consuming and often gives me blisters after several hours wielding the same tool. "Easter In Ula, Salmas" with the only multi-block coloured engraving I intend ever to do is available from The Jericho Press at a very modest price. Both illustrated their issues with images from my fine press portfolio edition of the engravings published the the Profile Books hardback. My exhibition at The Old Fire Engine House in Ely has been extremely successful. Although it is officially finished, it will continue to be shown throughout August. I did complete some new work in the weeks leading up to the opening of the exhibition and I will feature some of those in coming weeks. There is always a feeling of "Its that time of the year again" when Open Studios swing round in July. This year, time was decidedly tight after taking a week's holiday and then hanging and opening the exshibition at the Old Fire Engine House in Ely. I had a week to make sure that the work was ready and that the space was clear for me to bring my engraving studio out of the house to sit next to the printing presses. I will post again soon to catch up with recent work and publications.